According to its website "The Council of State Chambers (COSC) is the national organization for state chamber CEOs and their executive leadership. The purpose of COSC is to promote cooperation among state chambers of commerce, strengthen existing state chambers, and promote the extensions of the state chamber of commerce movement throughout the country." The group is part of a powerful network of organizations that serve, effectively, as arms of the U.S Chamber. The staff listed on the COSC website actually work for the lobbying group MultiState Associates Incorporated, which specializes in state and local lobbying and state-based legislative tracking. "With offices throughout the country and a network of over 2,000 lobbyists in every state capital, major city and U.S. territory, MultiState is well represented and poised for action." The Council of State Chambers, at the time called the National Association of State Chambers of Commerce, held its first annual meeting in Pittsburgh on October 9, 1924. For more information about the U.S. Chamber of Commerce and its affiliated organizations view the Sourcewatch page here. On April 4, 2016 the Center for Media and Democracy, publisher of Sourcewatch.org, released documents that it obtained from a top GOP polling firm, Luntz Global, which show widespread support from the Chamber's members for policies such as an increase in the minimum wage, paid sick leave, paid paternity and paid maternity leave. The polling showed that 80 percent of the state chambers' own business members supported minimum wage increases, while 73 percent support paid sick time. Yet over the last three years 48 state chambers have publicly opposed minimum wage increases. And in the last 5 years, 75 percent of the country's state chambers have opposed paid sick leave policies. Both measures are explicitly opposed in the U.S. Chamber's 2016 policy platform. "This webinar reveals just how deeply corporate interests and their lobbyists are influencing the priorities of state Chambers of Commerce, even when that agenda contradicts the opinions of their local business members," said Lisa Graves, executive director of the Center for Media and Democracy. "Rather than listening to its members and crafting a policy agenda that reflects their priorities, Chamber lobbyists pick their policy positions behind closed doors and then figure out how to convince their members to fall in line." She added, "It's a warped, undemocratic process, and the Chambers should be held accountable for their claims to the public, press, and elected officials that businesses oppose raising the minimum wage, paid sick leave, increased family and medical leave and other common sense policies, when in fact substantial majorities of business executives actually support these public policies." Luntz Global is a prominent GOP polling and communications firm headed by Frank Luntz. Its website states: "Our analysis of the results will help you learn exactly what your target audience wants ­and needs to hear." Frank Luntz, president and CEO of Luntz Research Companies, is a pollster and political consultant and a frequent commentator on Fox News. Luntz Global interviewed 1,000 registered voters and "C-level executives" (CEOs, COOs or CFOs) who were members of their local chamber (46 percent), state chamber (28 percent), or the U.S. Chamber (16 percent). 73 percent were CEOs or owners. 49 percent of the firms took in between $50 million-$500 million in annual revenue. 41 percent had 100-499 employees, whie 19 percent had 1,000 or more employees. CEOs support raising the state minimum wage 80 percent to 8 percent. 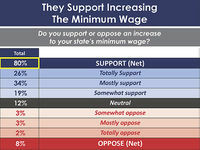 When asked which alternative to raising the minimum wage they preferred, a slight majority preferred the earned income tax credit as an alternative to other options presented. However, when a minimum wage hike was put head-to-head against increasing the earned income tax credit, raising the wage won by a solid margin 54 percent-46 percent. When asked during the webinar about these surprising results, Merritt said, "it is undeniable that they support an increase" in the minimum wage. "My guess is that they are looking at raising it as a priority... If you are fighting a minimum wage increase, you are fighting an uphill battle." He continued, "most Americans support it, most Republicans support it... A winning argument is to put it up against other issues where it drops as a priority," advised Merritt. "In isolation it is definitely a winner." 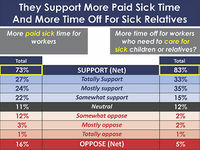 CEOs supported paid sick time 73 percent to 16 percent. When asked about "more time off to take care of sick children or relatives" CEOs supported it 83 percent to 5 percent. CEOs supported "increasing maternity leave" 72 percent to 9 percent, and supported "mandating paternity leave" by 82 percent to 7 percent. On predictive scheduling, CEOs support it 78 percent to 11 percent. 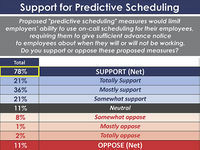 Predictive scheduling measures would limit employers' ability to use on-call scheduling for their employees, requiring them to give sufficient advance notice to their employees about when they will and will not be working. "On-call" scheduling practices at fast food restaurants and chain stores that do not allow employees to plan for the care of their children have recently come to public attention, prompting San Francisco to pass one of the nation's first ordinances to address the problem in 2015. Already industry is talking about preempting such ordinances in certain states. State Chambers along with the American Legislative Exchange Council (ALEC) have been pushing preemption of living wage, minimum wage, prevailing wage, and other progressive policies promulgated by localities for some time. Multistate Associates has been supportive of these state preemption efforts. In the Luntz Global poll CEOs were asked: "All of these issues may be important but when it comes to where an elected official stands, which issue is the MOST important to you?" "State preemption of local mandates" was at the bottom of the list at 10 percent. Of those who said "state preemption of local mandates are most important," only 18 percent, the smallest number, were worried about "ensuring local governments do not overly burden businesses when it comes to wages and benefits." "Keeping health care costs low for American families" was a key concern for CEOs. Significantly, it far outstripped "replacing ACA [the Affordable Care Act]" or "making health care affordable for small businesses" as a priority. Since at least 2004, the U.S. Chamber has been inviting state and local chamber staff twice a year to travel to resorts for "regional government affairs conferences." Like ALEC's conference model, the Chamber underwrites conference attendees' travel expenses with "scholarship" money. At the conferences, U.S. Chamber lobbyists, outside political consultants, professional pollsters and the CEOs of transnational corporations instruct state and local chamber staff on how best to follow the U.S. Chamber's agenda. On energy, attendees are regularly briefed by Karen Harbert, the president of the U.S. Chamber's "Institute for 21st Century Energy." Harbert and the "Institute" she presides over have long advocated for deregulating fracking, expanding offshore oil drilling in U.S. coastal waters, rejecting the Obama administration's Clean Power Plan, and vastly increasing coal and nuclear energy production. On international trade issues, attendees hear from the likes of Christopher Wenk, the "Director of International Policy" at the U.S. Chamber, on why local and state chambers should lobby lawmakers to pass "free trade" agreements like the TPP and TTIP. On labor issues, Glenn Spencer of the U.S. Chamber's "Workforce Freedom Initiative" regularly leads panel discussions. Spencer formerly worked for David Koch's Citizens for a Sound Economy operation (the predecessor of Kochs' Americans for Prosperity and also the FreedomWorks entities) and the National Republican Senatorial Committee. His briefings are anti-union. Conferences end with a "political workshop" highlighting the U.S. Chamber's latest approaches to effective electioneering. In one conference agenda's description, "Getting actively engaged in politics is the new frontier for chambers for a simple reason: it's easier to elect officials who understand your concerns than to convince officials who fundamentally disagree with you"
The Council of State Chambers is a 501(c)(6) non-profit organization and has 51 member organizations, of which 48 are state chambers of commerce. The other three are the Council on State Taxation, a trade association that exclusively represents mega-corporations that operate across state and international borders, the U.S. Chamber-affiliated ACCE , and the U.S. Chamber. COSC is individually incorporated but deeply embedded in the Chamber's infrastructure. Rob Engstrom, the U.S. Chamber's national political director, sits on COSC's board of directors; the other 10 members of COSC's board are state chamber CEOs. All 11 of them are members of the U.S. Chamber's elite CCC 100 organization. COSC's primary purpose is to hold meetings for lead state chamber lobbyists twice a year, which U.S. Chamber lobbyists routinely attend. COSC's small staff also sometimes hosts webinars to help the state chamber leaders in their legislative fights. COSC's actions show how they and the state chambers are subservient to the transnational corporate interests that underwrite the U.S. Chamber. Past COSC conferences have included trainings led by representatives from the American Legislative Exchange Council (ALEC), mega-corporations like Walmart, and the U.S. Chamber of Commerce. Also on the agenda was a 2016 political discussion led by the Koch-founded Freedom Partners organization, and a session led by a PR firm "on how best to message a free market approach to climate issues." COSC's conferences and webinars, coupled with the U.S. Chamber's avenues of influence, appear to have a substantive impact on state chambers' lobbying and policy positions. According to the group's 2014 IRS 990 filing there are 12 voting members on the governing body. Joe Crosby, executive director. According to his official biography, Crosby "first participated in COSC during his 11 year tenure with the Council On State Taxation (COST), which itself was founded by COSC in 1969." At COST, Crosby served as chief operating officer and as senior director of policy. He also "managed all aspects of COST's advocacy program and regularly testified before state legislatures and other state and national policy-making bodies." Crosby's prior affiliations include serving as national director of state legislative services for Ernst & Young LLP, working as a senior executive with "a state legislative tracking firm" (unnamed in his biography), serving as president of the State Government Affairs Council, and serving on the board of directors of the Washington Area State Relations Group. He is a principal at MultiState Associates. Bill Kramer, director of policy. According to LinkedIn, Kramer was also the Research Manager at the State Chamber Policy Center and a Senior Policy Analyst at Multistate Associates, the for-profit lobbying shop that staffs COSC. Kramer briefly worked as an intern for Senator Tom Carper (D-DE) in 2012, canvassed for Rep. Gerry Connolly (D-VA), and interned with California State Rep. Marty Block. He graduated from law school in San Francisco in 2010, after getting his BA in history from Ohio University in 2007. Mary Susan Braun, administrative director. In that capacity, "(Braun) coordinates COSC's financial management and contributes to meetings planning and execution," according to her official biography. Braun is the vice president of administrative services at MultiState Associates. Kathy Woolever, holds COSC's books and recordgs, according to COSC's 2014 IRS 990 filing. Board as of 2014; none of the following board members reported compensation from the organization in that year. Kevin Brinegar, Chair. Brinegar is the president and CEO of the Indiana Chamber of Commerce. Fred Morgan, Vice Chair. Morgan is the president and CEO of the Oklahoma Chamber of Commerce. Webb Brown, Past Chair. Brown is the president and CEO of the Montana Chamber of Commerce. Mark Wilson, Treasurer. Wilson is the president and CEO of the Florida Chamber of Commerce. Heather Briccetti, Director. Briccetti is the president and CEO of the Business Council of New York State. Chris Clark, Director. Clark is the president and CEO of the Georgia Chamber of Commerce. Jay Clemens, Director. Clemens is the president and CEO of Associated Oregon Industries. Catherine Glover, Director. Glover is the president and CEO of the Tennessee Chamber of Commerce and Industry and Tennessee Manufacturers Association. Jim Roche, Director. Roche is the president of the Business and Industry Association of New Hampshire. Rich Studley, Director. Studley is the president and CEO of the Michigan Chamber of Commerce. Rob Engstrom, Director. Engstrom is the senior vice president and the national political director at the U.S. Chamber of Commerce. Gene Barr, Director. Barr is the president and CEO of the Pennsylvania Chamber of Business and Industry. ↑ 1.0 1.1 1.2 1.3 Council of State Chambers of Commerce, IRS Form 990 2014, Internal Revenue Service, November 13, 2015. ↑ 2.0 2.1 2.2 2.3 2.4 Mary Bottari, Highlights of Luntz Poll of American CEOs Shows Broad Support for Progressive Policies, The Center for Media and Democracy, April 4, 2016. ↑ Council of State Chambers, Home page, organizational website, accessed April 28, 2016. ↑ 4.0 4.1 4.2 4.3 Multistate Associates Incorporated, Our Team, organizational website, accessed May 3, 2016. ↑ MultiState Associates Incorporated, Lobbying, organizational website, accessed May 3, 2016. ↑ Council of State Chambers, History, organizational website, accessed on April 28, 2016. ↑ PRWatch Editors, Exposed: Most CEOs Support Paid Sick Leave, Increased Minimum Wage, and More But Chamber Lobbyists Told How to "Combat" These Measures, The Center for Media and Democracy, April 4, 2016. ↑ Luntz Global, Home page, business website, accessed April 29, 2016. ↑ Luntz Global, "Our Team," corporate biography, accessed July 2016. ↑ Brendan Fischer, "Corporate Interests Take Aim at Local Democracy," Center for Media and Democracy, PR Watch, February 3, 2016. ↑ U.S. Chamber of Commerce, Karen Alderman Harbert organizational website, accessed April 29, 2016. ↑ U.S. Chamber of Commerce, Christopher Wenk, organizational website, accessed April 29, 2016. ↑ U.S. Chamber of Commerce, Glenn Spencer, organizational website, accessed April 29, 2016. ↑ 14.0 14.1 Calvin Sloan, Unmasking the Chamber of Commerce Networks, The Center for Media and Democracy, April 5, 2016. ↑ 15.0 15.1 15.2 Council of State Chambers, COSC Staff, organizational website, accessed April 29, 2016. ↑ Council of State Chambers, Joe Crosby, organization website, accessed April 29, 2016. ↑ Bill Kramer, Bill Kramer, LinkedIn, accessed April 29, 2016. ↑ The Center for Media and Democracy, CMD on Chambers Whos Who re Webinar, PRwatch.org, March 31, 2016. ↑ Council of State Chambers, Mary Susan Braun, organizational website, accessed April 29, 2016. ↑ Indiana Chamber of Commerce, Kevin Brinegar, organizational website, accessed May 3, 2016. ↑ State Chamber of Oklahoma, Fred Morgan, organizational website, accessed May 3, 2016. ↑ Montana Chamber of Commerce, Montana Chamber Team, organization website, accessed May 3, 2016. ↑ Florida Chamber of Commerce, Mark Wilson, organizational website, accessed May 3, 2016. ↑ The Business Council, Bio: Heather Briccetti, organizational website, accessed May 3, 2016. ↑ Chris Clark, Chris Clark, LinkedIn, accessed May 3, 2016. ↑ Associated Oregon Industries, AOI Team, organizational website, accessed May 3, 2016. ↑ Catherine Glover, Catherine Glover, LinkedIn, accessed May 3, 2016. ↑ Business and Industry Association, Board of Directors, organizational website, accessed May 3, 2016. ↑ Michigan Chamber of Commerce, Rich Studley, organizational website, accessed May 3, 2016. ↑ U.S. Chamber of Commerce, Rob Engstrom, organizational website, accessed May 3, 2016. ↑ Pennsylvania Chamber of Business and Industry, Gene Barr, organizational website, accessed May 3, 2016.